DHCP seems like a seemingly innocent, but common protocol, that can be used against our network. 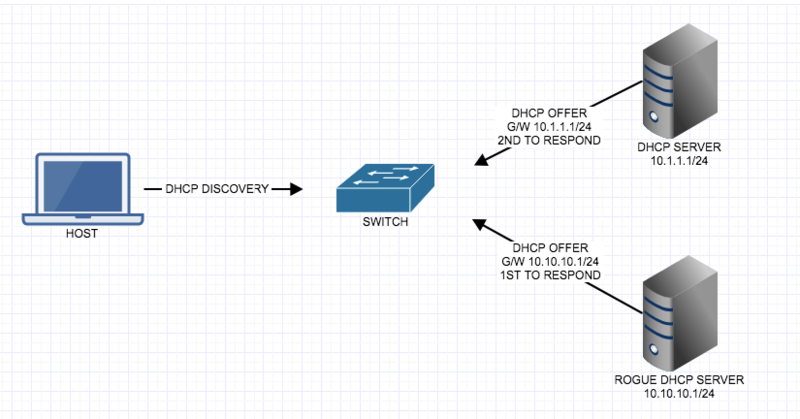 Since we know the DHCP discovery packet is a broadcast packet, just looking for a DHCP server and the host doesn’t care what DHCP server sends a DHCP OFFER back, it will accept the first offer, the DHCP offer includes information such as IP address, Subnet Mask, Default Gateway, DNS information. What if the first offer that is returned is a Rouge or Malicious DHCP server? Does that mean all traffic from that host using the Rogue DHCP servers gateway could be looking at all of the traffic passing through it? Yes! We can prevent this from happening with a feature called DHCP Snooping. DHCP Snooping is going to snoop or listen into DHCP traffic to make sure that DHCP conversations go to the correct interface and allow that traffic to pass, otherwise it will be dropped. The interfaces to a known good DHCP server will be ‘trusted’ and all other interfaces will be untrusted, therefor the switch will know if DHCP conversations are happening on an untrusted interface then the traffic will be dropped and the interface will be put into err-disabled mode. By default the switch considers all ports untrusted. We have to enable DHCP snooping globally, then trust at the interface level. IP ARP inspection and IP source-guard are dependent on DHCP snooping being enabled. When packets come in on an untrusted port with option 82 set, those packets are not dropped. The switch will insert its own DHCP option 82 information (the switches MAC address), and when the packet is returned it will make sure its own DHCP option 82 information is in the reply if it is, it will remove its option 82 information and forward the packet normally, if not it will drop it. This check is enabled by default. As part of the CCNP Switch you get introduced to a topic called SPAN and Remote SPAN. This feature allows Network Engineers to capture packets flowing to and from a Interface or VLAN and mirror or forward those packets to a Packet Capture Analyzer software such as Wireshark. Make sure you destination port is of equivalent speed to the Source port otherwise you could drop packets. The source can be set to entire VLAN’s (VSPAN) or individual ports. The Source is the port or VLAN you want to monitor. Here is how to setup the Source SPAN interface. The Destination is the port you have the network analyzer connected to. 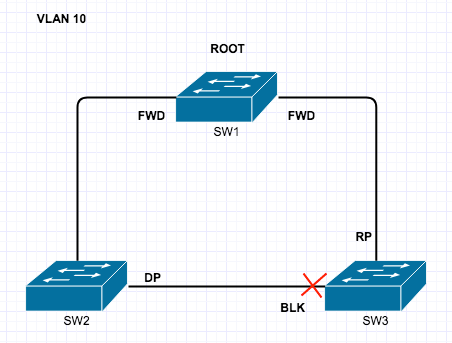 Verify your SPAN port setup. All switches have to be RSPAN capable. Source and Destinations will be slightly different on each switch so don’t just copy the commands on each switch. 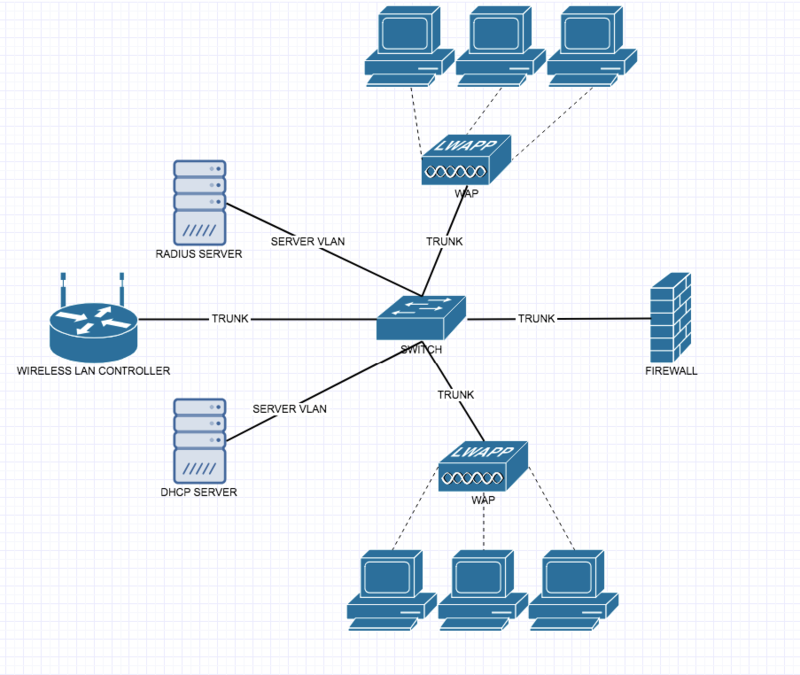 If you have a setup similar to below you have to name Remote SPAN VLAN 4000 on all intermediate switches. Is this frame from a trusted Source? That is the question! 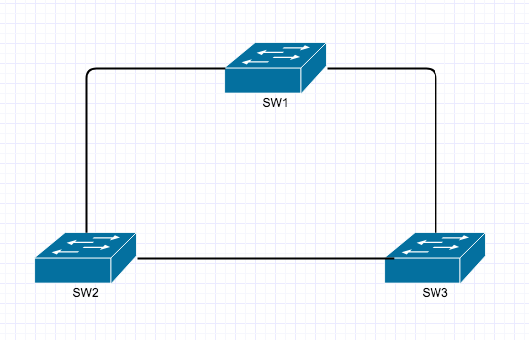 As I continue my CCNP studies, I near the end of the CCNP Switch Course, this is a topic that was covered in the CCNA, and I haven’t really touched it since, so here is a refresher. A port enabled with port security will expect to see frames sourced from a particular MAC address or group of MAC addresses, if the switch receives a frame from a MAC address it does not have listed the port takes action according to the violation mode that is set. The violation mode by default is to shutdown the port. 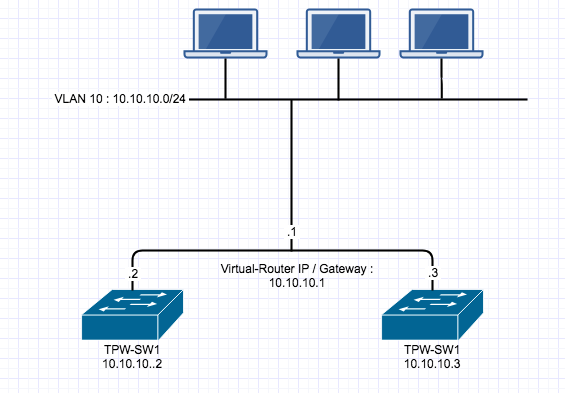 tpw-sw1(config-int) switchport port-security violation ? 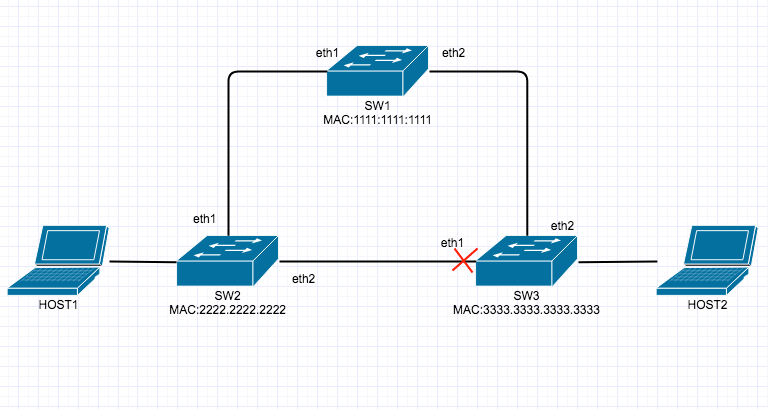 tpw-sw1(config-int) switchport port-security mac-address ? tpw-sw1(config-int) switchport port-security aging ? This is just the very basics of Port Security, there is similar implementations on all switches I have worked with. Virtual-ARP or VARP is a routing technique that allows multiple switches or routers to simultaneously route packets from a common Virtual IP (VIP) address in an active/active switch/router configuration. Each switch or router is configured with the same VIP address on the corresponding VLAN interfaces (SVI) and a common virtual MAC address. In MLAG topologies, VARP is preferred over VRRP because VARP does not require traffic to traverse the peer-link to the master router as VRRP would. A maximum of 500 VIP addresses can be assigned to a single VLAN interface. All virtual addresses on all VLAN interfaces resolve to the same virtual MAC address. However you cannot have a secondary VIP on the same VLAN interface, you can however implement VRRP on the same VLAN interface as VARP. VARP functions by having each switch respond to ARP and GARP requests for the configured router IP address with the virtual MAC address. The virtual MAC address is only for inbound packets and never used in the source field of outbound packets. The following commands configures 10.10.10.1 as the virtual IP address for VLAN 10. The Virtual-Router MAC address is entirely invented by you, I had a real issue finding clarification that it was just a made up MAC address, so here is my invented made up Virtual-Router MAC 1010.1010.1010 as the virtual MAC address on both switches. I also ran into an issue where #ip routing had to be enabled. I have been gathering a bunch of Linux/Mac Commands that I have found useful, hopefully someone else will find this list useful. Even although there are many versions of STP they all use a very similar set of rules. STP is a feature used to prevent loops when you are using redundant switches and without STP a loop could form and cause a number of problems on the network. During a unicast broadcast message (which happen all the time) the switch will forward the frame out of every port except the one it came in on. Therefore if SW1 sends a frame out and SW2 and SW3 receive it then SW2 and SW3 will forward out all ports except the one it came in on. SW2 sends to SW3 and SW1. SW3 send to SW2 and SW1 and you can see how the loop is now beginning to form. This is known as a broadcast storm, this can kill a switches CPU and Memory usage very quickly. The second problem is the MAC address being changed all the time as it receives frames. For example SW1 sends a broadcast message, SW2 and SW3 receive it, then forward it out all other ports like in the scenario above. 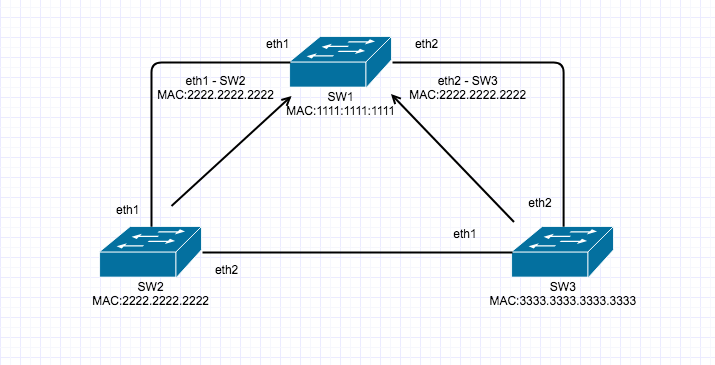 However each switch learns the MAC address of the next switch and assigns that in the MAC address table, but if you consider SW1 sending to SW2 and SW3 and then SW2 and SW3 forwarding those frames and they eventually get back to SW1 but on different ports, then the MAC Address table will change constantly from I know about SW2 on this port, I now know about SW2 via SW3 on this port, and that can cause unstable MAC address tables. 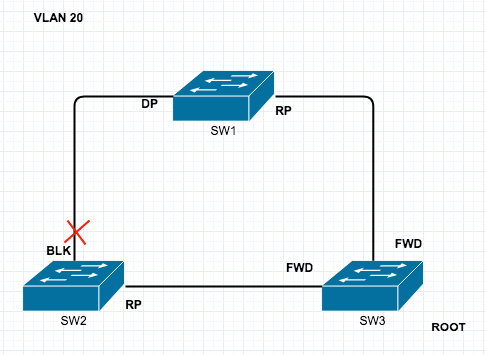 HOST1 sends data to HOST2, however since SW2 doesn’t know how to get to SW2 it sends frames out all ports, thus sending to SW1 and SW3 so HOST2 receives frames from HOST1 via SW3 and then again via SW1>SW3. This is known as Duplicate Frames. So how do we fix the issues mentioned above? Thats right Spanning Tree Protocol by blocking one of the redundant paths. The question now becomes how do the switches decide on that Port to block? STP follow’s strict rules, when deciding what ports to block. 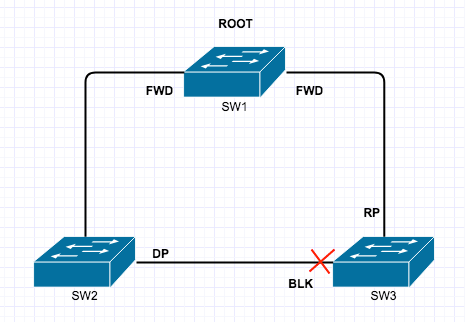 3) Select Root Port on non-Root Bridge Switches (RP) – this is the best root to the Root Bridge. 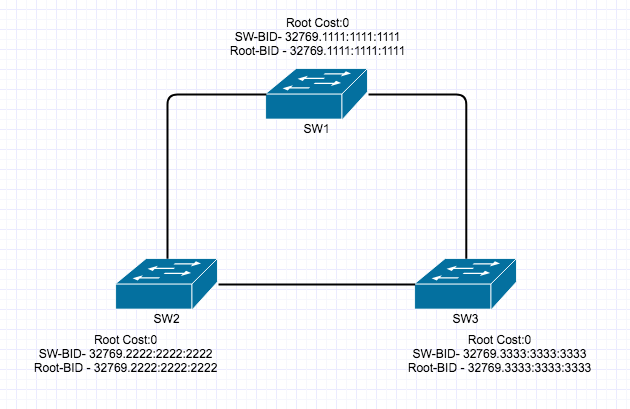 Designated Ports : The Lowest cost alternate best root to the Root Bridge. Non Designated Ports : All other ports that are in blocking mode. When ports change from one Role to another it will go through the Port States. Note also that the Listening and Learning states are transitional and it wont stay on either. This is what it looks like after, when the lowest BID wins. The ports on each switch now transition into their respective states following the STP Rules as mentioned above. The ports can change based on the Cost of each link. 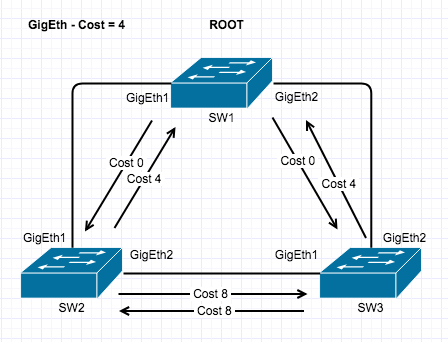 The port costs are listed below, however in this example we will just be using Gig Ports, but for clarity a FastEthernet Port will be slower than a GigEthernetPort, the faster the port the lower the cost. The Root Port (RP) is the lowest port cost. Of course there can be ties between multiple connections and STP can be tuned. 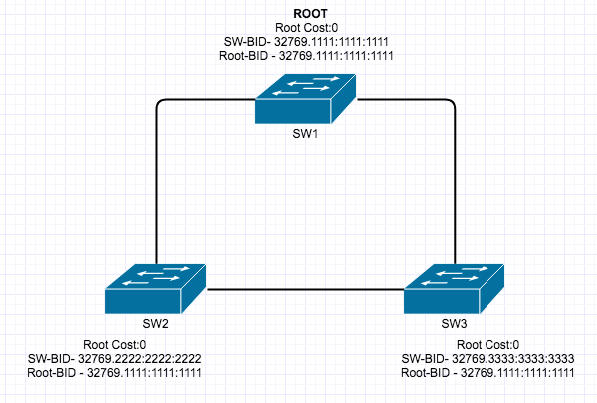 Designated Ports are selected by Root Cost the by Lowest BID and then by lowest numbered Interface. Therefor in the diagram above the Designated port would be GigEth1 on SW3 since it is a lower numbered interface than SW2 GigEth2. All ports that are not Root Ports or Designated Ports are Blocking Ports. From the time a link goes down to convergence it takes a total of 52 Seconds. When STP was designed that was fine but now, this is much too slow which is where Rapid Spanning Tree Comes in. = 21 secs to convergence. I hope this have given you a good explanation of STP. Telnet is a Network protocol that allows users to connect to and administer a devices Command Line Interface (CLI). However all of the information exchanged on a Telnet session is unencrypted, this means is someone is sniffing the traffic from your host to the device it can be read clearly. So now all know telnet is a super un-secure way to access the CLI of a device, and you should always use SSH where you can, but Telnet can be used in another way. Telnet can only be used to verify network connectivity to remote devices that are TCP based, because TCP is a connection-oriented protocol. I get requests all the time to open up specific ports on the firewall. You can find a list of the well know port numbers here. Before I start poking holes in the firewall or other device I check to see if it is already open. If a user asks me is https (port 443) is open to and on a specific server you can easily test with Telnet. If a remote host does not respond to telnet it can mean a number of things. The Firewall or Firewalls or other networking devices on the path to the remote host is Denying or Dropping the packets. You will be able to confirm that in the logs on the firewall. Further troubleshooting is required if you encounter issues. The complete list of assigned ports and their assigned services can be seen at http://www.iana.org/assignments/service-names-port-numbers/service-names-port-numbers.xml. In todays scenario, I am going to walk through some changes I made and troubleshooting steps for when I recently added a moved a old SSID/Subnet off an old legacy wireless network onto a new network same IP space and SSID that requires RADIUS authentication. These steps can be applied to many different scenarios for troubleshooting DHCP, I just made these ones specific since it was something I recently had to troubleshoot. Here is a basic diagram of the setup, showing all the moving parts would be overkill for the diagram. The steps on what to do and troubleshooting are below the diagram. Split-tunneling is a networking approach that lets a remote user using Remote Access Virtual Private Network (RAVPN) to have specific traffic sent to the internet instead of being sent over the encrypted VPN tunnel. E.g. – A remote user is using a home network, hotel network or coffee shop to Remote Access VPN (RAVPN) to connect to their works corporate network . 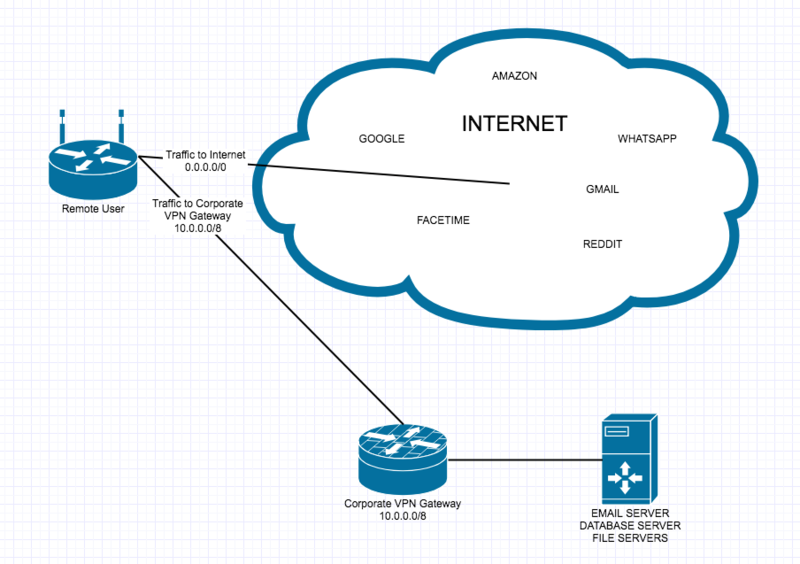 The user or VPN subnet with split tunneling enabled can allow the user to send specific traffic such as; access to company file stores, company database servers, company mail servers and other servers on the corporate resources through the RAVPN connection. When the user connects to Internet resources such as Web sites, Personal Webmail, Voice or Video calls, etc. 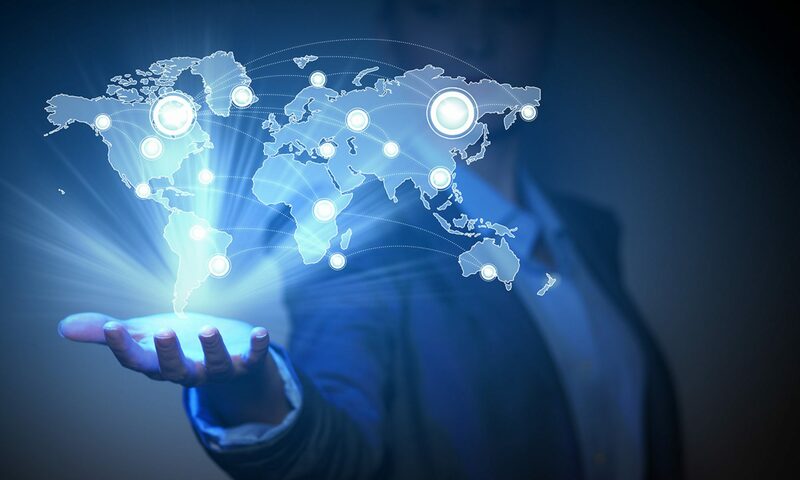 ), the connection request can be sent directly out the local gateway provided by the home network, hotel network or coffee shop, thus preventing the traffic from being sent to the corporate network to be redirected to the internet, instead just going directly to the internet. There are some Advantages of Split-Tunneling can be preventing bottlenecks especially if the user uses Voice/Video calls, where the calls can be severely depredated due to having to pass through the VPN tunnel first. There are also some disadvantages of Split-Tunneling in that the user now by-passes Corporate security controls that may be in place by the Security team for access to specific sites etc.